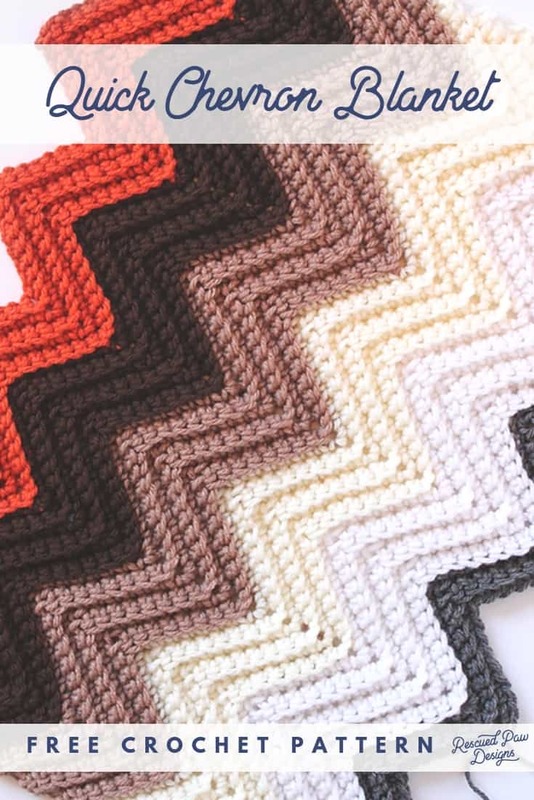 Learn how to make an easy chevron crochet pattern today with the free blanket tutorial below! I hope you enjoy this simple chevron pattern! This post contains affiliate links to products for your convenience. If you purchase via my links, I may receive a small commission at no additional cost to you. 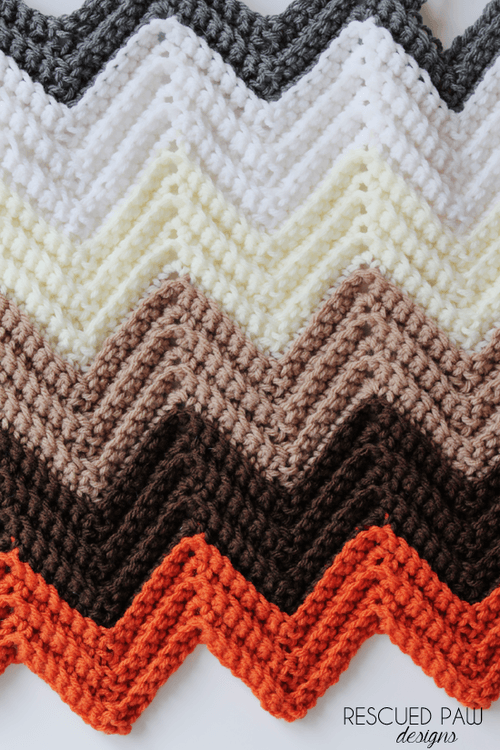 This easy chevron crochet blanket pattern is a must have! 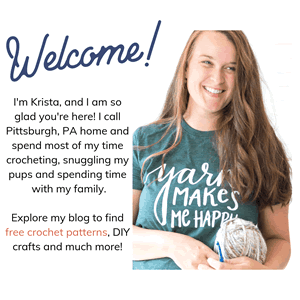 This single stitch crochet chevron pattern is easy to learn and is great for any crocheter looking to try something a little different. This simple stitch repeat is one that I promise you can master in no time at all almost like my other pattern I designed the Crochet Chevron Neutral Blanket Pattern. 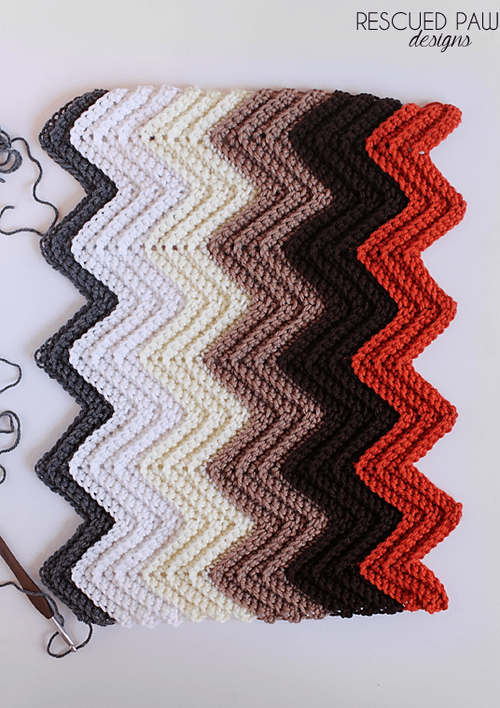 The Yarn that’s perfect for this single crochet chevron! For my chevron blanket I used the Impeccable Yarn brand from Michaels but a good substitute would be Lion Brand Vanna’s Choice Yarn. Vanna’s choice also happens to be my favorite acrylic yarn to use for all of my blankets! This yarn holds up well to my kids daily antics and washes beautifully! 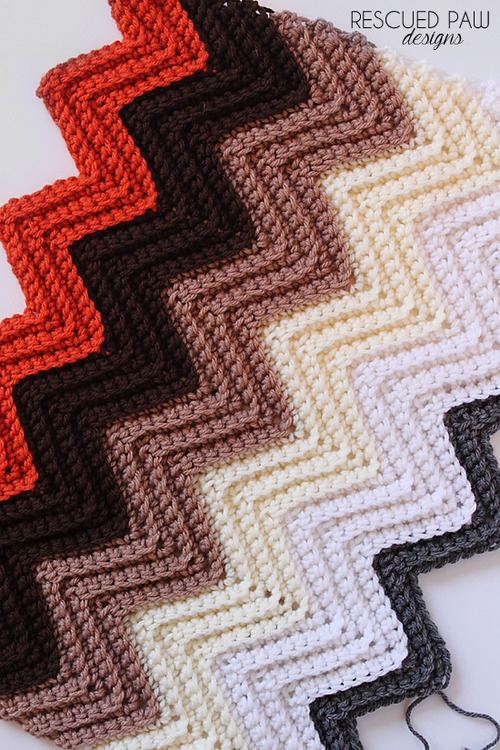 This chevron uses Only single crochet stitches! For this single crochet blanket we will be crocheting in just the back loop of each stitch which will create an awesome ridged texture. 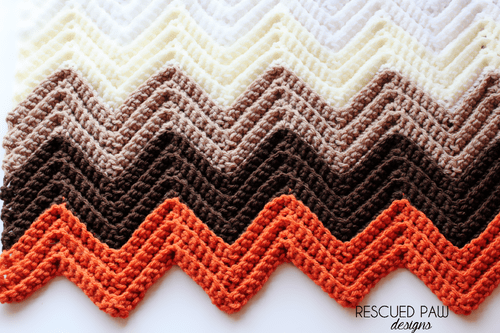 If you ready to learn how to do make a chevron blanket or as some may call it zig zag using just single crochets, then read on down for the full, FREE crochet ripple blanket & throw pattern! You will need to use a starting chain in a multiple of 17 to start, then chain an additional 15 to whatever length starting chain you picked to start your blanket. It is the perfect blanket to customize to just the size you need! 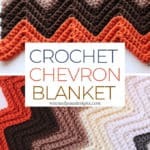 I recommend for beginner crocheters to give his chevron blanket pattern a try (and these blankets too!) 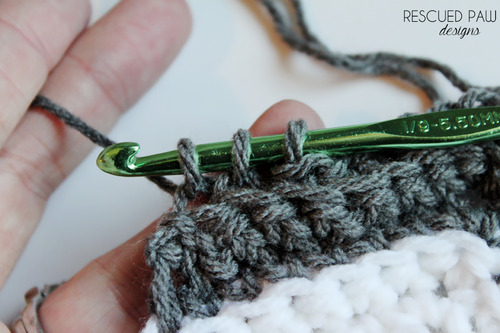 because of the easy single crochet stitches that are used throughout. It really is a great beginner project! I added a bit of texture to it by crocheting only in the back loop of every stitch which creates an awesome ridge like texture and gives the blanket a bit more character. Ready to start on this chevron pattern? 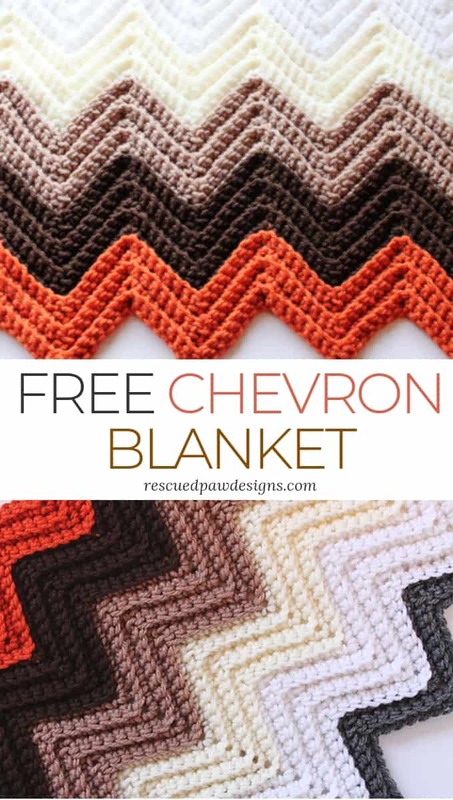 Read on down for the free chevron stitch tutorial to get started on your blanket today! I can’t wait to see all your finished projects! Any type of yarn ( I used a worsted weight 4 yarn) – Amount of yarn needed will vary with weight used, size of blanket etc. BEGINNING CHAIN: Chain a multiple of 17 then chain an additional 15. 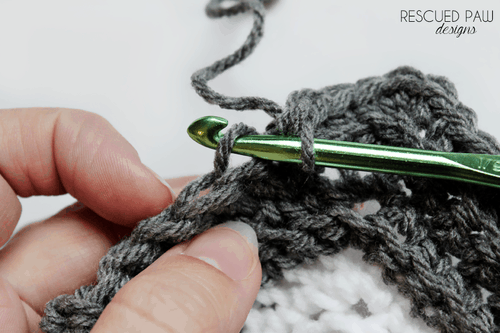 How to Single Crochet Together: pick up a loop in each of the two stitches you will be crocheting together , yarn over, and draw through all 3 loops on hook. ROW 2 continued: 1 Sc in next 5 stitches, 3 Sc in next stitch, * 1 Sc in next 7 stitches, skip next 2 Sc. 1 Sc in each of the next 7 stitches. 3 Sc in next stitch, Repeat from * across until you reach last 7 stitches. 1 Sc in the next 5 stitches. Sc2tog in the last 2 stitches, turn. ROW 3: Ch1, sc2tog, 1 Sc in next 5 stitches, 3 Sc in next stitch, * 1 Sc in next 7 stitches, skip next 2 Sc. 1 Sc in each of the next 7 stitches. 3 Sc in next stitch, Repeat from * across until you reach last 7 stitches. 1 Sc in the next 5 stitches. Sc2tog in the last 2 stitches, turn. 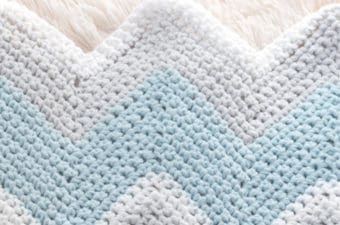 If you decide to make a blanket with this technique and need help with changing colors check out my tutorial on how to change colors in crochet. I hope you enjoyed this single crochet chevron blanket pattern and if you have any questions, please feel free to ask! Want to Stay Connected? 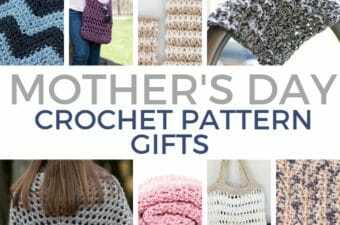 Join me on Facebook or Pinterest to know when all my patterns are released. PS: If you’d like to try a chunkier but similar version of this pattern I’d suggest checking out my Chunky Chevron Blanket Pattern! I would do a single crochet border with 3 single crochets in each corner stitch to finish it off. Thank you! Really like how it turned out! 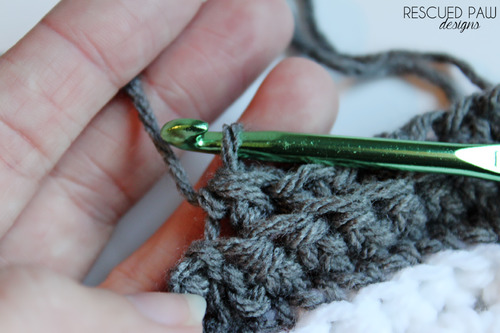 If you do this the chevron pattern in double crochet, do you use the same instructions? Do you do a double crochet in the third chain to srart back? I have been crocheting for some time now and I’m really confused to as how I can not figure out how this pattern makes sense. The pattern doesn’t make perfect v’s. This pattern does not indicate how much yarn would be needed to finish the afghan.Thank you for the pattern.. I had an afghan very similar to this many years ago made by my husbands aunt as a wedding gift. It was stolen when our house was broken into. My son has asked me to find a similar one for him. Krista, I am going to make a full size bed afghan for my great granddaughter using 2 colors. I am confused as to how many chain stitches to start off with. Do you recommend worsted weight 4 yard to make this large afghan? Hi Krista, Finally a chevron pattern that I like. I want to make 2 throw blankets for 2 twin beds for my grandsons. How many stitches/chains, do you think I should do for the throw blankets? I would use a 221 then add 15 to that length. Average crochet throw blankets are about 52″ by 60″. 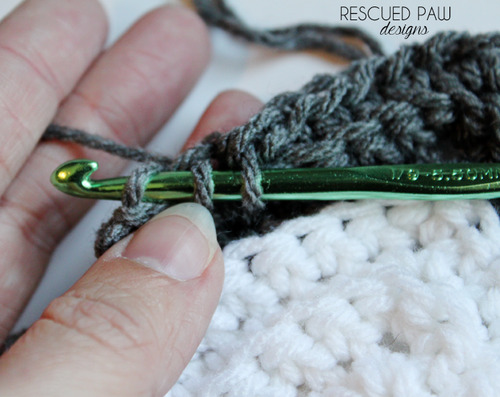 Can you do this pattern using double crochet instead of single? If so, how would that change the turn instructions? Thank you so much love this way stylish blanket pattern!! Hi Alicia! It sure can! For a double crochet do a chain 3 instead of a chain 1. Hey. How many chains did you do for the blanket you made in the pics. I want to make one about that size.Thanks! I don’t remember exactly since this was a few years ago. I hope I am not to late for this. When you skip the two sc do you count that as a stitch or do you start counting after that . I think I have the peaks good but the valleys are messed up. Thanks for your time and pattern. Krista, first of all, THANK YOU for this beautiful pattern! I’ve always wanted to crochet one of these. I’m having a bit of a problem. Do you continue with the ENTIRE 2nd row? (chain one, skip first sc, sc 2 tog, sc5, then sc3 in the same, then the 7, etc) from there every row after the first 2nd row? That would mean I start with sc2tog and end with sc2tog on each row? Somehow it’s not coming out right. I know these directions are really good and simple. Wonder what I’m doing wrong? You are correct. You always end and begin with a sc2tog. 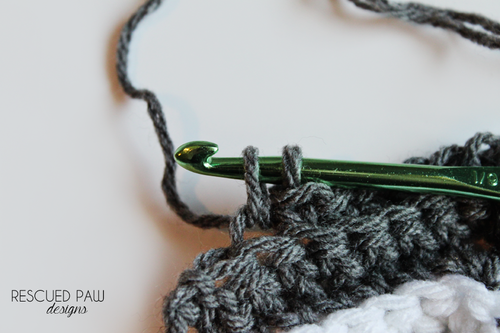 🙂 I would suggest using a stitch marker for every 10 stitches because it is SO easy to skip stitches with chevrons. Hope that helps! So this is my first attempt at crocheting a blanket… is the first row supposed to look just like the pattern? Because mine is quite zig zagged but does not lie flat like yours does in the pictures. The free pattern is near the bottom of the page. Hope this helps! It would really be helpful if you would list the number of starting chains for each size blanket, i.e. twin, double, queen, etc,, and the amount of yarn for each size too. Hi! I’m having a problem with row 3. I know it says to repeat row 2 going forward, but no matter how many times I count, recount, mark with stitch markers….if I skip the first stitch, I end up short. Should I really just start each rown with the sc2tog and forget about the skipping of the first stitch? I fixed the pattern. I apologize about the typo on my end. Row 3 is supposed to start without skipping a stitch and then continue on like row 2 is written. This was one of my first patterns when I started designing and unfortunately I did not do it at the time but I will make a note to update it to include this. Happy Crocheting. Approximately how many yards/ounces of yarn would you recommend for a lap sized blanket/throw using a size I9 hook? Thank you. 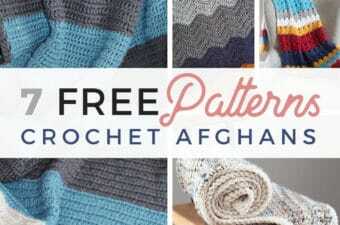 Want Free Crochet Patterns Weekly? Join 82,000 + other crocheters who have subscribed because getting FREE crochet patterns every week is AWESOME! © 2019 – Rescued Paw Designs part of Cagle Online Enterprises, Inc. All Right Reserved. Rescued Paw Designs is a participant in the Amazon Services LLC Associates Program, an affiliate advertising program designed to provide a means for us to earn fees by linking to Amazon.com and affiliated sites.